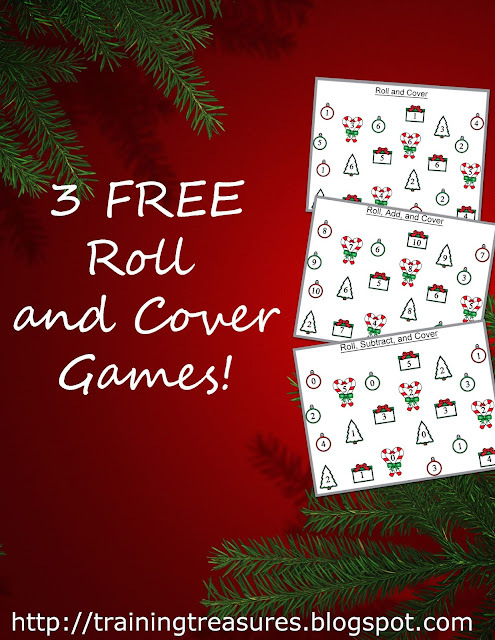 Training Treasures: 3 FREE Christmas Roll and Cover Games! 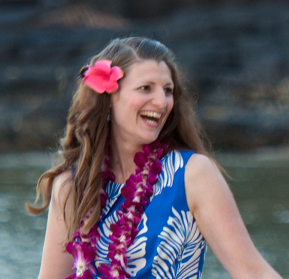 If you're like me, you're tired of the same boring math homework that is sent home with kids. One of the kids I watch after school has a sheet with a list of math activities to choose from. Problem is, the activities don't change throughout the school year! And the activities are not even challenging enough for him. So why not replace one of those activities with something on their level? Especially when the teacher (or me for that matter) doesn't even know whether or not the kid played the game listed? Whether practicing math facts for homework, tutoring, or at a math center, here is a fun activity I'm sure you've seen- Roll and Cover games. I made 3 different games for 3 different skill levels- basic addition, basic subtraction, and subitizing. If you are teaching children on different skill levels, this is a great activity to pull out. The younger ones (like my 2-yr old) won't know that older brother is playing a different game than he is, and vice versa. Playing is very simple. For the addition and subtraction games, players simply roll 2 dice. 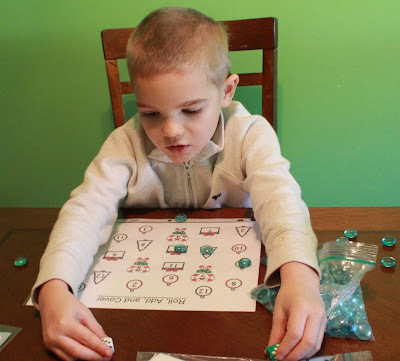 If they are adding, they add the numbers and cover the correct sum with a game marker (buttons, gems, etc.). If they are subtracting, they subtract the smaller number from the larger one and cover their answer. 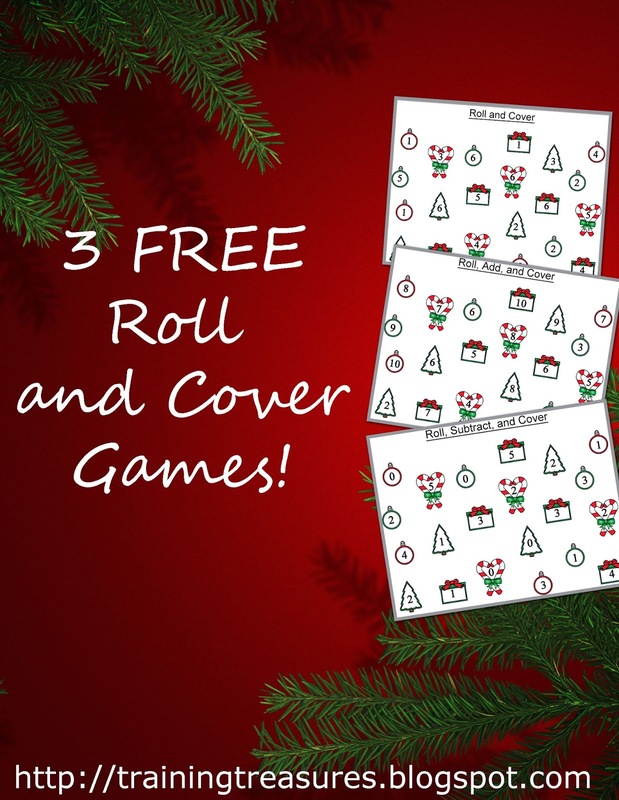 For the basic roll and cover game, child rolls one die and covers what they rolled. Game is over when the page is filled. These can be single or multi-player games. Everything comes easy to this 5-year old, so I love challenging him. While he knows the 0, 1 and some of the 2 addition tables, that's as far as we've gotten with addition. But who says he can't do this game? All he has to do is count the dots! And I have to say that he does need help counting those dots. He likes to start from 1, but with this game I was able to teach him that you don't start counting with 1 if you already know there are 6 dots on that die! He was getting the hang of that shortcut by the time we were done! He loved this game, and what makes this Mama proud is that hours later he told me when he has a 4 on one die, and 2 on the other, that makes 6! So with little or no prep, and while having fun, your child can learn their math facts too! I love adding color graphics to all of my printables, as it really makes learning so much more appealing! Print in grayscale if you wish, but I think the cost of color ink is well worth it when a child learned something and had a good time doing it! Find this download for free in my TpT store! Subscribe by email, and be the first to know of any freebies or updates!